Thank you @larus for new stills.... Looks like the BTS of the poster shoot. OMG..!! He is nailing his character to the extend..!! . He is known as a hard working actor. A grand salute for CHOI DANIEL..!! . Side note here : He always chose the best romantic drama scripts to act in. But this is totally another world..... I wonder why he chose a horror drama this time..?? . Hope it won't be too horrific. WOW!! I've been looking forward for the trailers....And this is so amazing... Daniel & Eun Bin are nailing their characters so very well....!! . I really hope this would be a huge hit for KBS2..!! Where are the other chingus...???? OMG..they should watch this. We must get together for this amazing K-Drama.....!!!!!!!!!!!! Choi Daniel, who is experiencing strange things in the darkness, is appalled by the eccentricity of "Do you think this will hurt you? Lee jia 's intense visuals with his blood - soaked floor and red dress swiftly, prompting a curious case of shocking events. In the meantime, Park Eun Bin appears with a sparkling eye, saying, "Find me, the man who killed my younger brother." It raises curiosity about what kind of secret is entangled in her brother's death. 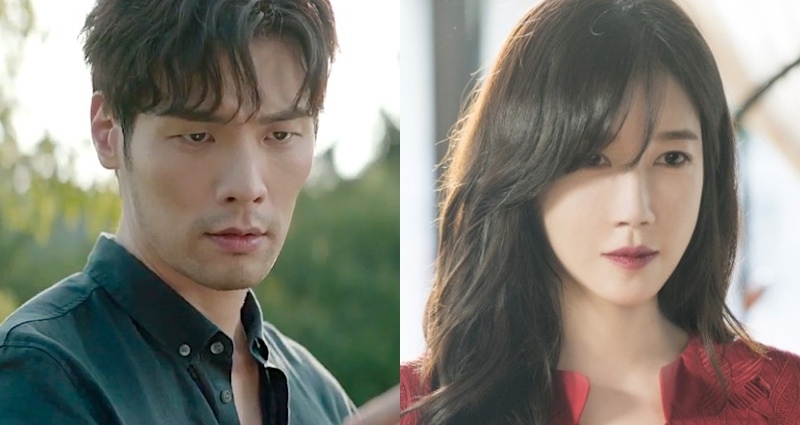 Choi Daniel and Park Eun Bin, who are rushing to the scene of the crime, are expecting an imminent and speedy development, raising their expectations. And all I want to know is, what exactly is the airing date for this drama...?? The wiki says it's 28 Aug, 2018..., but the trailer says it's 05 Sep 2018.. . I am so confused....!! But anyway, I am super excited for this drama.... It's my favorite K-Actor Choi Daniel . He looks so handsome in beard... he he . The official website and Naver promote it for a premiere on September 5th. Which would mean there is a week inbetween the drama ending prior this drama. Wow!! with those still cuts, I can't wait to watch them on the screen. Plus Choi Daniel is so cute . I wonder KBS release another teaser trailer soon....?? I wonder KBS release another teaser trailer soon....?? Yes, we have another teaser. Teaser trailer #2 for upcoming KBS2 drama series “The Ghost Detective” starring Daniel Choi, Park Eun-Bin and Lee Ji-Ah. Teaser trailer #2 starts out like a romance themed drama series, but quickly shows its horror genre roots. Today's Detective>, a second teaser video was released. Especially, the mood swings from a sweet melo to a thrilling horror. KBS2 The new tree drama "The Detective of the Day" is a god-like horror thriller that falls into a bizarre event when it meets Sun Woo-hye (IJIA) who is a questioning woman. Thank you @larus for those pics & trailers.... And as it's said the second trailer started as a romance based drama series... but quickly showed horror stuff...!! WOW.... I am so in love with the first half of the second trailer... It really is romantic . Can't wait till Sep 05 for the premiere.... Hope other chingus watch the second trailer as well...!! KBS’s upcoming horror drama “Today’s Detective” (working title) released eerie, suspenseful teasers starring the three main leads. “Today’s Detective” tells the story of detective Lee Da Il (Choi Daniel), who chases after ghosts, and his energetic assistant Jung Yeo Wool (Park Eun Bin). The two are dragged into a bizarre case as they encounter a mysterious woman called Sun Woo Hye (Lee Ji Ah). The second teaser is deceiving as it opens up with Park Eun Bin standing under the radiant sunshine with a sweet melody playing in the air. Everything seems peaceful until Choi Daniel walks up to her and puts her hearing aid on for her. As soon as her hearing aid is on, she hears a sharp screaming as all sorts of horrific images flash through her mind. I've been waiting for English translation of those 2 teasers.... Thank you once again @larus for the soompi article... . And is something wrong with the soompi after its 20 years anniversary...?? I can't comment on the soompi article even if I am already logged in.. .
Maybe it is just an adjustment to all the changes. It looks like being logged in in Soompi forum is not enough. As I expected/ I guessed, Lee Ji Ah will play a ghost. Being in red I wonder if she is not much more that that. Yes... you are correct. about Lee Ji Ah. When I first read that she will be a red dressed woman who shows up at every crime scene, I immediately guessed that she is a ghost... Oh yes, this will be a totally entertaining drama from once in a while... . And don't you think it contains some romance b'cause the second trailer started off with a romance hinted scene..??!!. he he... did you see the Hancinema article on the second trailer...???!! Who knows...??!! It's the K-Drama land...!! Anything is possible. . Choi Daniel & Park Eun Bin are just great in acting.... Can't wait till the premiere.. It's Sep 5, so we have to wait another week from Aug 29...!! I don`t expect romance but as you said it is possible. I think that it won`t be a clasic romance like in romantic comedies and I did not even want that but a closeness between the main leads, a special friendship between them with romantic hints I totally see it. We`ll find out what we`ll get soon. I really like your idea of "a closeness between the main leads, a special friendship between them with romantic hints". . As in the second trailer, looks like our detective dearest sweetly cares about her...!! And of course, it won`t be a classic romance like in romantic comedies, but looks like something on the way... .
Side note : I am a huge Choi Daniel fan girl.... I've watched all his dramas so far...!!!! And the majority was romantic dramas... So this is a totally different drama of his for me.... I am not interested in horror types, but this is definitely in my watch list b'cause of Daniel . hope it'll turn out to be a hit for KBS....!!!! !